This laksa relies heavily on fragrant kaffir lime leaves to really lift it from ordinary to extraordinary. 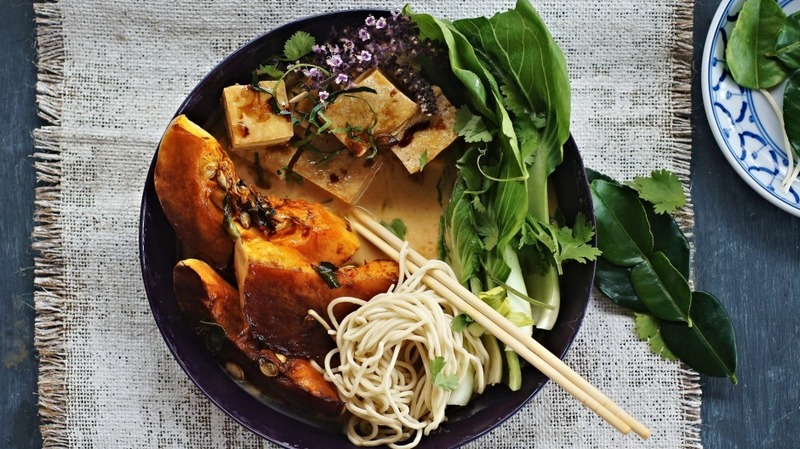 Skip the fish sauce for a vegan-friendly version of the creamy, spicy soup; it gets a protein boost from the tofu, and the caramelised pumpkin gives a gorgeous mouthfeel. For the pumpkin, add all ingredients to a bowl and toss to combine until the pumpkin slices are evenly coated. Place on a tray and roast for 35 minutes or until cooked through and golden. Set aside. While the pumpkin is roasting, start the soup. Place a nonstick frying pan over medium heat. Add the laksa paste and cook until it begins to separate and becomes intensely fragrant. Add the kaffir lime leaves and cook for another 30 seconds before adding the remaining ingredients, except rice noodles. Reduce heat to low and simmer gently for 20 to 30 minutes to allow the flavours to build. While the soup is simmering prepare the tofu. Add the oil to a saucepan over high heat. When the oil ripples and begins to shimmer, add the tofu pieces and fry quickly, turning with tongs until golden brown. Drain on paper towel. To serve, divide the soup among four bowls. Add the bok choy so it cooks lightly in the soup (rather than turning into a soggy mess). Top with noodles and slices of pumpkin. Add a few tofu pieces per serve and garnish with herbs and fresh kaffir lime leaves.